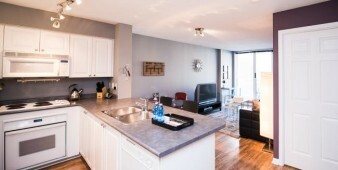 The benefits of this Toronto short term rental are rarely found in the bustling city centre. The 650 square ft. suite combines an open floor plan with 9 ft. ceilings to provide guests with a comfortable and stylish space. This furnished suite washes over you in shades of blue, white, and grey. It is exquisitely decorated with modern furnishings and tasteful wall hangings. The kitchen is a grand and inviting space. 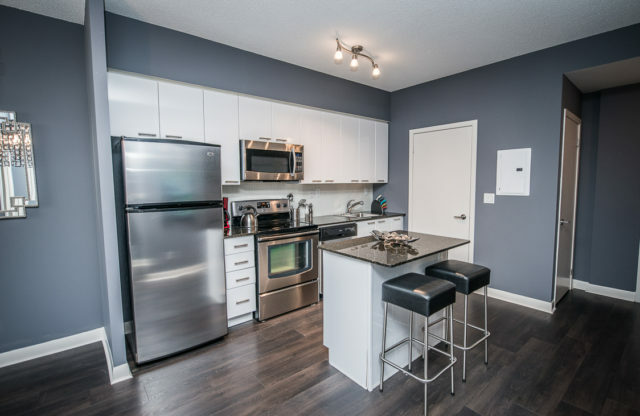 It features full sized stainless steel appliances including; a stove, fridge, microwave, and dishwasher. 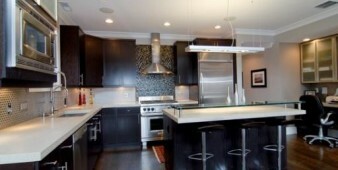 It comes complete with wood cabinetry, granite countertops, and versatile island. A spacious dining table sits just in front of the kitchen, making a small barrier between the living room and the kitchen. It can easily sit four people. Guests need not worry about cooking utensils or cutlery as it is all provided by Sky View Suites. The living room is set against a backdrop of floor to ceiling windows, that allow a steady stream of natural light to floor the space. 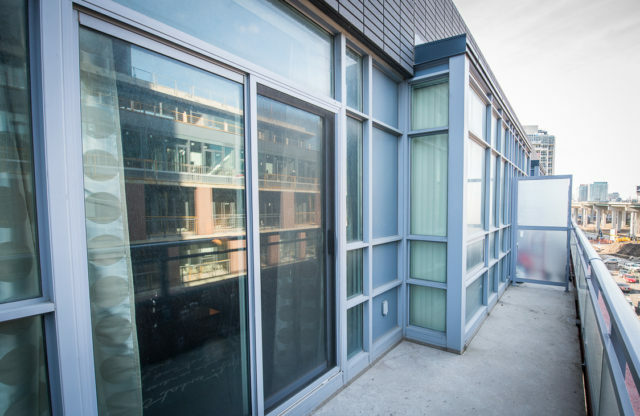 Here guests will also find a sliding door that allows guests to access a beautiful private balcony. Steal yourself away to this breath of fresh air and enjoy your morning coffee in peace. 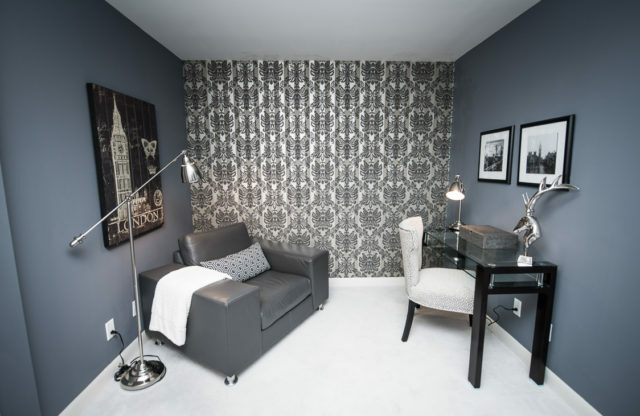 The den is a modern, secluded work space that is comfortably furnished and perfect for getting some work done at home. 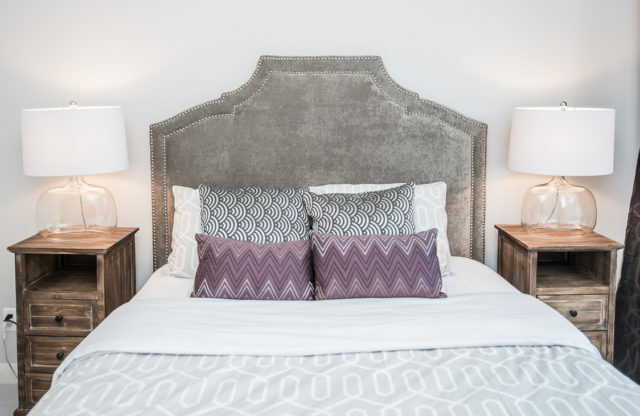 The bedroom in this furnished rental is luxuriously lined with a queen-sized bed, matching end tables and plenty of closet space. You can easily imagine yourself falling into the covers of this room and recharging a tired body. The bedroom is also set against a backdrop of floor to ceiling windows. 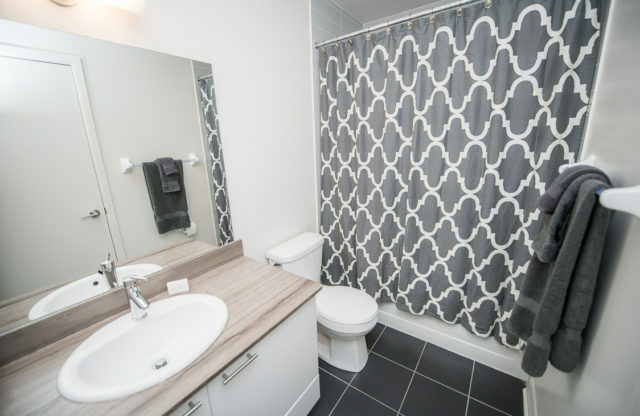 The bathroom is a modern space that matches the dark grey hues of the rest of the furnished apartment. Guests will find a sink surrounded by a sleek stone countertop, complete with plenty of storage beneath it. In addition, there is a convenient bath/shower combination in this space. 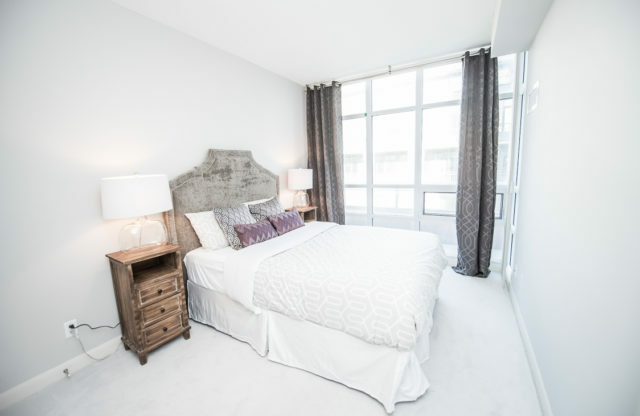 Sky View Suites is happy to provide all the linens needed for both the bedroom and bathroom for it’s guests. 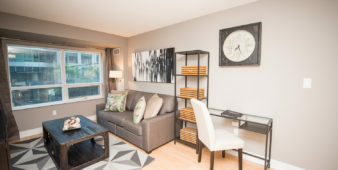 The highly sought after location of this divinely furnished rental put right where you want to be. It is located central core of downtown Toronto. The entertainment district is only a few minutes away and this is one of the most popular areas in the Toronto area. 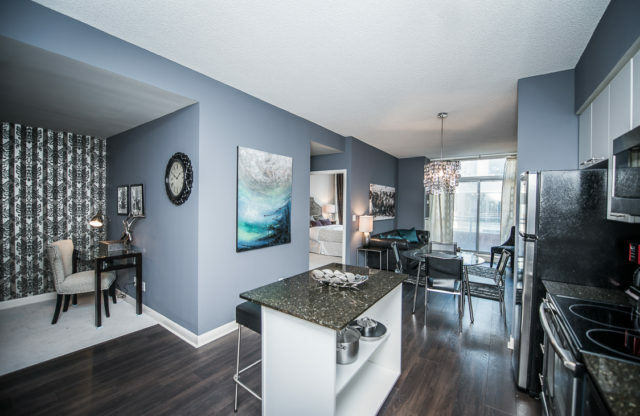 This district is well-known for housing some of Toronto’s most recognizable landmarks and most popular tourist attractions. The CN Tower is the second tallest freestanding building in the world and arguably the most notable. This tower maintains a gut-dropping glass floor, awe-inspiring revolving restaurant, and death-defying EdgeWalk. The Rogers Centre is another venue worth your while. This is the largest stadium in the Toronto area with a capacity to seat over 55,000 people. It is home to various touring celebrities as well as Toronto own baseball team, the Blue Jays. The only Canadian team in the MLB. When you start feeling peckish there are of course hundreds of restaurants you could try. However, Buca is a wonderful little Italian restaurant just a few minutes away. This restaurant upholds a 4.2-star rating and offers guests a thriving, high-end setting. Old York Bar Grill is another option that might tickle your fancy. It upholds a 4.5-star rating and serves eggs benedict, nachos, and wraps paired with signature cocktails in a low-key setting. There are virtually hundreds of activities capable of occupying your time during your extended stay. 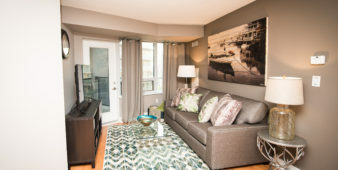 The prime location of this rental suite means there are essentials such as grocers and pharmacies near by as well. 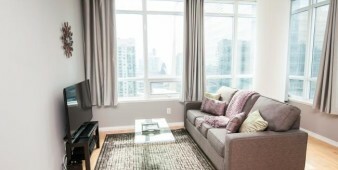 The host building of this luxurious 1-bedroom +den Toronto short-term rental offers its guests a specific set of desirable amenities in order to make their stay as care-free as possible. 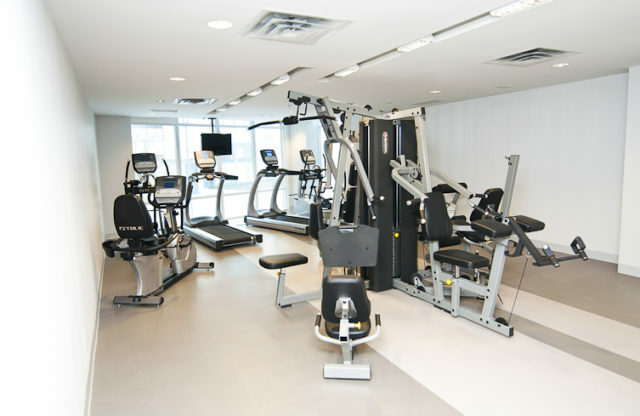 The most notable of these amenities is their fully functioning and multi-purpose gym. The gym is a fantastic studio to work through your frustrations or get rid of some extra energy. It is intelligently located so that you don’t have to travel far to get your daily workout in. But wait, there’s more. As a guest of Sky View, you will also be awarded all of the amenities that Sky View affords. 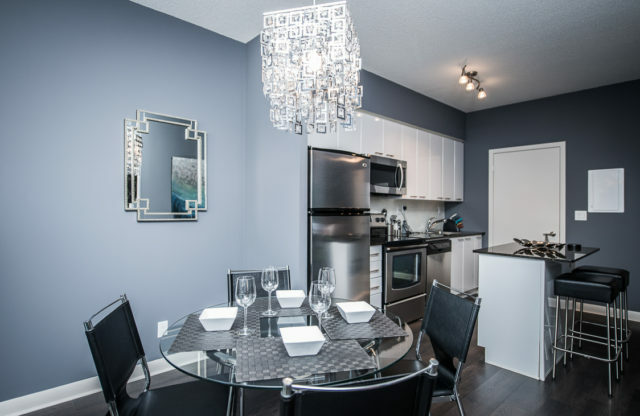 These amenities include; wireless internet, cable TV, a fully equipped kitchen, en-suite washer/dryer, bi-weekly cleaning service, local calling, and parking. All of these services are provided to Sky View’s customers at no additional cost. 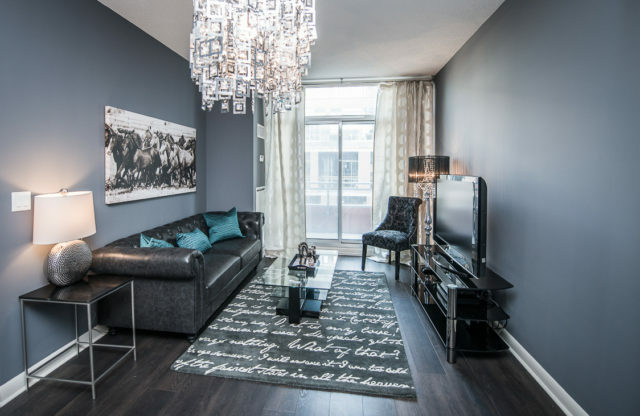 This makes renting a furnished apartment in Toronto through Sky View is a cost effective alternative to traditional hotel room rentals.